A dam built at the confluence of Pecan Bayou and Jim Ned Creek formed Lake Brownwood, an area whose history is made rich by Native Americans, Spanish explorers, and European and Anglo American settlers attracted to the water and attendant wildlife. In 1933 the Brown County Water Improvement District sold 537.5 acres on its new Lake Brownwood to the State Parks Board for $1.00, for the purpose of establishing a state park on the lake. Known first as Brownwood State Park and then as “Thirty-Sixth Division State Park,” Lake Brownwood State Park stands, with its many structures designed by National Park Service architects and executed by CCC enrollees, as the most extensively developed CCC park in Texas. Begun by the Civil Works Administration in 1933, the park held great promise when the CCC arrived in 1934. Construction on the more than 100 projects continued until 1942. 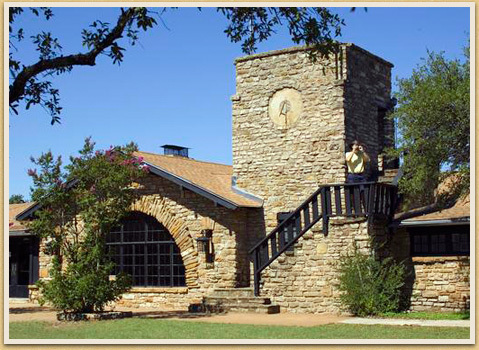 The CWA-built native stone refectory, designed by Waco architect Roy E. Lane (appointed in late 1934 as the first “State Parks Architect”), became the centerpiece for CCC work directed by Superintendent Nottie H. Lee (later State Parks Board Executive Secretary). In addition, the CCC constructed seventeen stone cabins, a monumental boat dock stairway with shelter overlook, a lodge for fishermen, two residences, and entrance portals, plus numerous lakeside and trailside features made of locally quarried rock and milled lumber. Two trail systems connect the CCC features and structures: one parallels the bank of the lake, connects all the CCC cabins with various picnic areas and firepits, runs past the terraced CCC boat dock, and terminates at the grand concession building. The other trail rises to a rock outcrop, again linking numerous CCC features and providing excellent overviews of the lake. Entrance Portals, Park Road 15, Combination Building/Clubhouse (built by the Civil Works Administration and expanded by the CCC), Cook’s Quarters, Guest Cottage, Caretaker’s House, Games Warden’s Cottage, Seventeen Cabins, Lookout House-Stair-and-Pier, Fishermen's Barracks, Furnishings, Bath House, Stone Boat Docks, Trails, Trailside Rests, Picnic Facilities, and Concessionaire’s Residence. The Concessionaire’s Store and Service Station was designed but not constructed.